Loretta Helms, Rebekah Helms, John Cundiff, Jeryl Cundiff, Mary Gilley, Ron Gilley, Debby Biessenberger and Tommy Biessenberger. 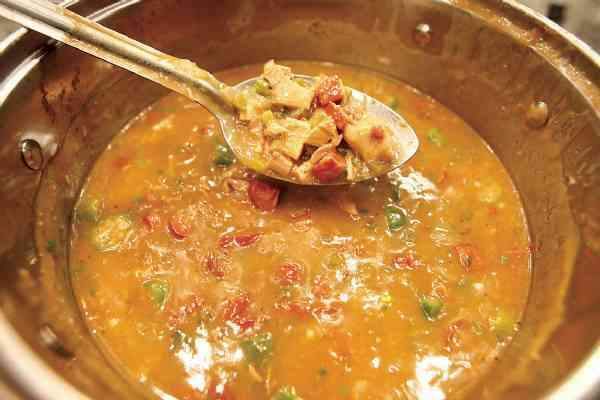 A new school in Durango instructs people in the art of cooking, including how to incorporate amphibious creatures into a stew.Todd Escudier, executive chef at Rylee Mac's Market & Cooking School, had a couple of surprises for students who watched him prepare Seafood Gumbo. "Frog legs and alligator meat? In Durango? Whoa!" said student Jeryl Cundiff. "It's a swamp thing," said Escudier, who is a native of Louisiana. Like a good gumbo, the market and school is a blend of many flavors, and it combines exotic tastes with down-home comfort food. Rylee Mac's opened Dec. 1 in the new plaza at the intersection of Florida Road and East Animas Road (County Road 250). The business includes a market with groceries and deli take-out food, plus a separate cooking school. Owner Terri D. Steinberg said the business was named after her granddaughter. Steinberg formerly owned Terri D's salon in Durango, which was sold three years ago. She reinvested in the complex of buildings that include Rylee Mac's. "I was going to stay retired, but I was bored," she said. The economy is a challenge for any new business, but Steinberg is confident for the future. "It's important for locals to support local merchants and stick this thing out." Steinberg studied culinary arts at the Cook Street School of Fine Cooking in Denver and was a personal chef for many years. Her staff includes executive chef Escudier and chefs Victor Villarreul and Daniel Rossiter. The market has food to go for people on the run. A deli menu includes breakfast, lunch and dinner. Breakfast burritos cost less than $5, sandwiches cost $8-$9 and salads are $7-$8. A selection of dinners to-go varies, but can include herb-roasted chicken, game hen, beef or vegetable lasagna, chicken or beef enchiladas, and stuffed pork chops. The dinners cost $12 for a single and $16 for a family. In addition to the deli, there's a store with gourmet items and a small selection of produce. A shelf was dedicated to specialty salts, and the pasta section had some intriguing flavors, such as chocolate fettuccini. Steinberg said future plans for the market include adding more locally grown and produced food, and finishing an outdoor water feature and patio, which will have a grilling area for summer dining. The kitchen classroom, set apart from the market area, is modern and sleek with stainless steel. It has multiple cooking stations, bright lighting and red, white and black accents. 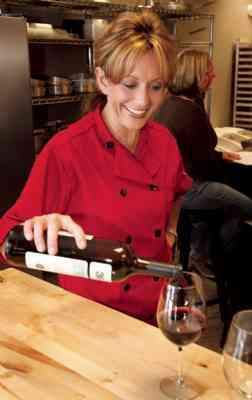 Some of Rylee Mac's classes are hands-on cooking, and some are demonstrations followed by tastings. There are classes for all skill levels, and there also are children's classes for the young beginner. "In a mixed class, I teach to that beginning level," said Escudier. But Steinberg encourages experienced cooks to come, too. "You may just learn one thing, but it's something really helpful. I learned something in every class I took," she said. Escudier said taking a class is different from learning from a cookbook or TV program. "It's more of a social event. People are laughing, joking, drinking wine." Part of the appeal of taking a class is the entertainment value, said Escudier. "People want to get out of the house and do something fun. With demonstration classes, you don't have to get involved, you just watch and then eat." 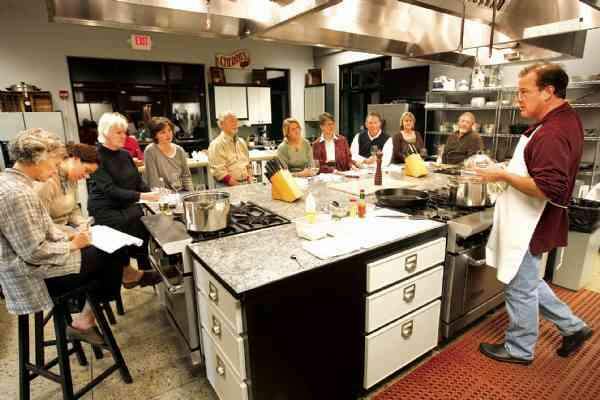 On the evening of Feb. 5, nine people gathered to take the "Stews & Gumbos" class taught by Escudier. The students sat on stools, drinking wine, nibbling hors d'ouevres and peppering the chef with questions as he worked. The mood was playful at the start, and by the end of the evening after the drinks and camaraderie, it was gleeful. Escudier had the class roaring with laughter when he described the juice that comes with oysters. "We cooks call it oyster liqueur, because it sounds nice. But you know what it is? It's oyster spit." Escudier offered snippets of Cajun history and anecdotes as he cooked. He was enjoying the banter, but he also was clearly serious about food. To make the class more interactive, Escudier asked the students to stir and check the consistency of the dishes, then taste them before and after seasoning to get a feel for the process. The participants peered seriously into the pot, sniffing, stirring and murmuring approval with oohs and aahs. He provided the students with recipes (two are reprinted below), so they could follow along and then try the dishes at home. But he also advised them to substitute items and tailor the dish to their liking. "We don't want to follow the exact recipe," he said. "Improvise. Do something different. "It's cooking. It's an art." Rylee Mac’s Market & Cooking School is located at 1485 Florida Road in the new plaza at the intersection of East Animas Road (County Road 250). Cooking classes are offered for all ages and levels of skill. Some are hands-on and some are demonstrations. Class fees range from $65 to $85 per person. Upcoming classes this month include a kids’ class on Valentine treats (today, 6:30-9 p.m.); romantic Italian Valentine dinner (Thursday night); winter braising (Feb. 19); hors d’oeuvres & wine cocktail party (Feb. 20); 30-minute meals (Feb. 26); and Bring a Friend to Dinner (Feb. 27). Private classes for groups are also available. Call 259-4960 or visit www.RyleeMacs.com to reserve a space. The market’s winter hours are from 7:30 a.m. to 7 p.m. Monday through Friday and 10 a.m. to 6 p.m. Sunday.